First, I kept getting erratic spikes and couldn’t read the voltage coming out of the sensor. At this point I was only using a Digital Multi-Meter. I thought I might have bad test leads or something, so I switched to the Oscilloscope. Good thing too! I now had a running history of the spikes logged on the O-scope’s screen and could see the problem when I wiggled the sensor. I could tell the leads were loose and would make poor contact. so I bent a bump in them to make sure there was good pressure in the connector. Next, now that the sensor is outputting a consistent voltage, it still wasn’t meeting the datasheet specs. 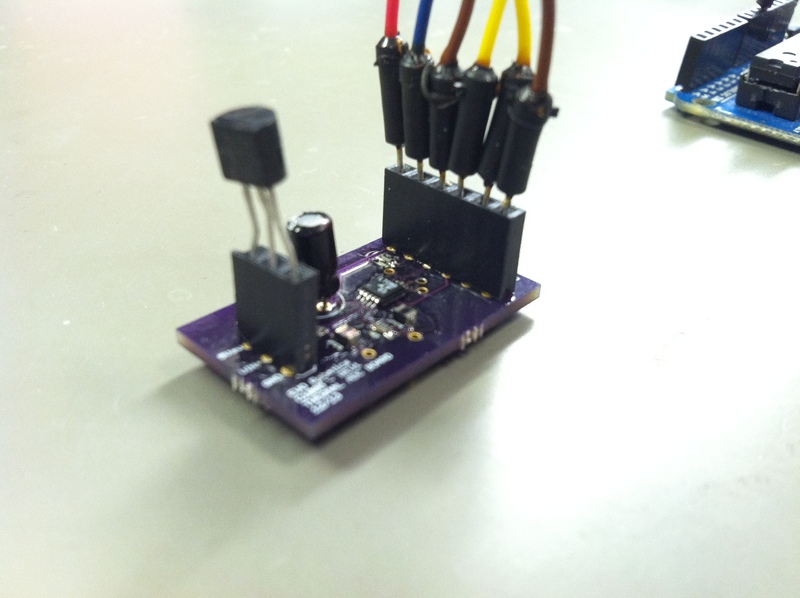 At 25C, the sensor should put out about 1.98V… but it was only outputting ~1.73V. This may not seem like a lot, but when your sensor is designed to operate at 22mV per degree C… that would be almost 11.5 degrees off! That’s awful! Next, I checked the supply voltage to the sensor. It was at 4.49V! I looked back at my wiring and saw that I plugged it into the ‘Vin’ pin not the ‘5V’ pin. Stupid mistake, but a good lesson. When debugging, always start with the basics. Now it reads 1.98V… right on the money! Now to see if the ADC is working.